A promising start to David Millar’s season threatened to be ruined by a crash at Paris-Nice which side-lined him for almost two months. Returning to action at the Giro d’Italia, he was far from his best form but rode through a fortnight and was in great shape by the time the Dauphiné Libéré started. A late attack at Dijon on stage two was thwarted when he was overtaken by the sprinters when in sight of the line, but third place in the long time trial Valence put him in a great position overall. Millar was strong on Mont Ventoux, setting up a ninth place finish overall. The Tour de France threatened to be a case of nearly but not quite, again. He was only 14th in the Monaco time trial, then was caught and passed after a superb attack for glory in Barcelona. A great ride at Annecy in the time trial resulted in fifth place. But his selfless work for Garmin team-mates Bradley Wiggins and Christian Vande Velde should not be discounted. Remember the way he led round the corner onto the lower slopes of the final ascent to Verbier to put Wiggins in a perfect position. Beaten by Fabian Cancellara in the first long time trial at the Vuelta a Espana was probably not a surprise. After all, so few people get the better of Cancellara. Come the second time trial of the race, at Toledo, Millar was a deserving winner, not merely because Cancellara had withdrawn to prepare for the Worlds. 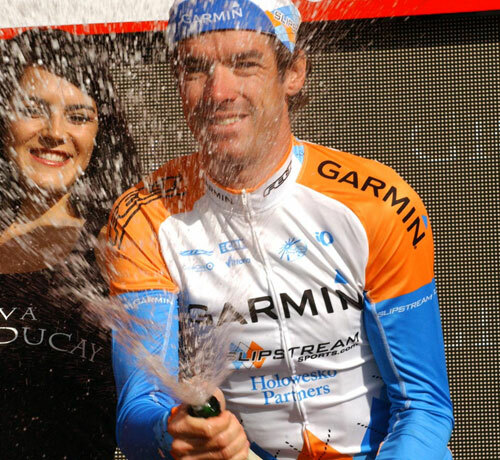 It was Millar’s first victory in Garmin colours and his first since winning the British national time trial championship in 2007.